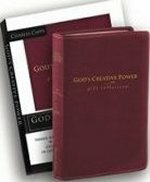 Add God's Creative Power Gift Collection CD Set? God's Creative Power Will Work for You has been a much loved scriptural resource for many years. With more than 3 million sold, God's Creative Power for Healing and God's Creative Power for Finances were released. This amazing series has now sold more than 5 millions copies! The God's Creative Power Gift Collection combines all three of these powerful teaching books into one volume. Providing concise teaching and applicable Scripture-based confessions, readers will learn how to put God's creative power at work in all areas of their life. They will discover and develop an understanding of how their words combined with God's Word will positively affect their future. God's Creative Power series perfect for a gift! I've given away this collection book of Charles Capps God's Creative Power Series to several believing friends. Its a nice way to give something that can truly change someone's life for the better!